This 2.5 mile hike passes a small waterfall and two beautiful rock crags. The views are pretty limited, but it’s still a worthwhile hike in the vicinity of Hone Quarry. If you visit in early July, the blooming Rosebay rhododendron is impressive! 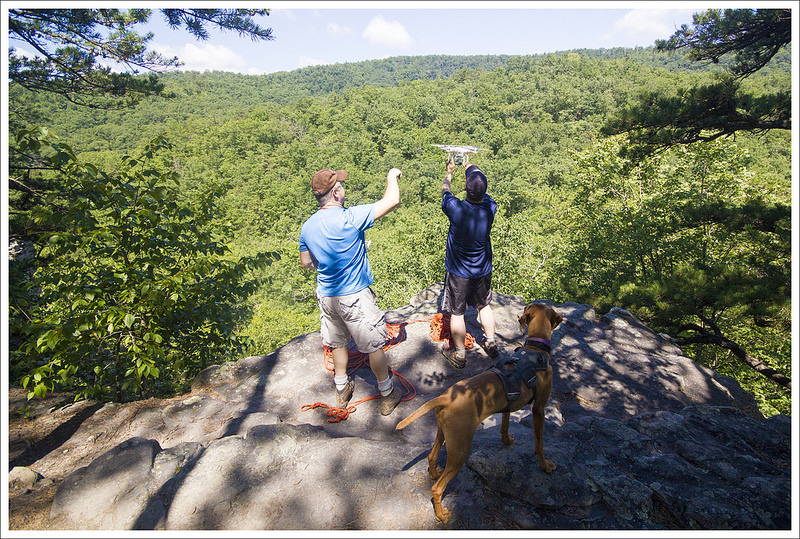 Tony and Adam launched a drone from the top of Hidden Rocks. 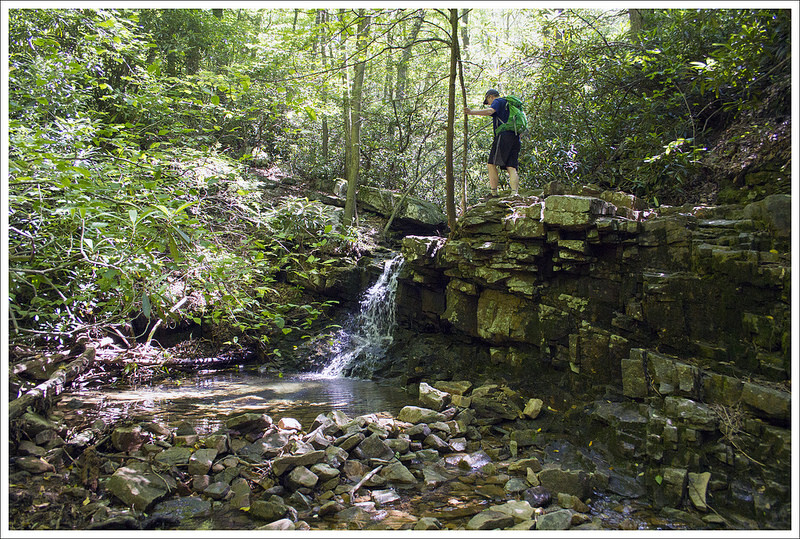 Below: Adam crosses Rocky Run – a small stream on the hike; The trail splits and makes a lariat loop near this pretty small waterfall; Blooming Rosebay Rhododendron. Hidden Rocks was truly trying to stay hidden from us. It took a while for us to find the location of this hike from another website, it was steering us about 35 minutes off course. We ultimately arrived at the correct parking area and met up with Tony and Linda from Hiking Upward to start our hike for the day. This hike is relatively easy and if you want to just do a quick, out-and-back hike to the main rock outcropping, you would be looking at around a two mile hike. We decided to make a loop out of this hike and at the time, there wasn’t a lot of information about this hike. The hike started from the right of the parking area. The yellow-blazed trail starts fairly easily and consists of a few ups and downs, reminiscent of a roller coaster before finally descending down to Rocky Run which you will reach at .65 miles. Crossing the stream, you can see there is a smaller trail that branches to the right, but stick to the left. You will quickly come into a thick tunnel of rhododendron. You cross Rocky Run a couple of more times before reaching a small, scenic waterfall at .9 miles. Here, the trail splits as you will see yellow blazes that go to the left and right of the waterfall. Take the trail to the right of the waterfall (the left trail will be how you return on the loop) that leads steeply above the waterfall area. A rock climber descending Hidden Rocks. 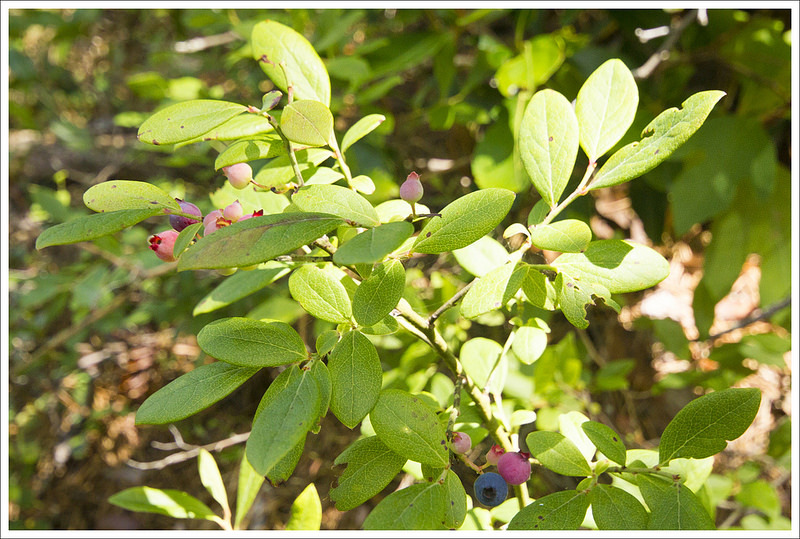 Below: Christine and Adam atop Hidden Rocks; Ripening blueberries at the top of the crag; A sideview of Hidden Rocks. In a short distance, we arrived at the base of the Hidden Rocks face where we came across a man rock climbing and rappelling off the structure. 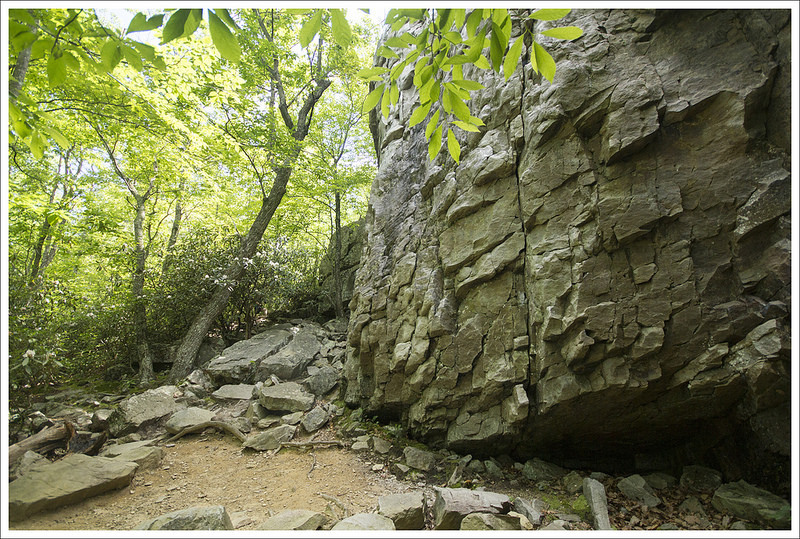 The trail skirts along the left of the rock base and then climbs steeply up some rocky steps. At the top of the trail, the trail splits. Head up to the right on some wooden steps to reach the top of the Hidden Rocks structure that you saw from the base a few moments ago. There was a campsite at the top and a couple of ledges that you could enjoy the view. Tony set up his drone to take pictures and video of the area around us. 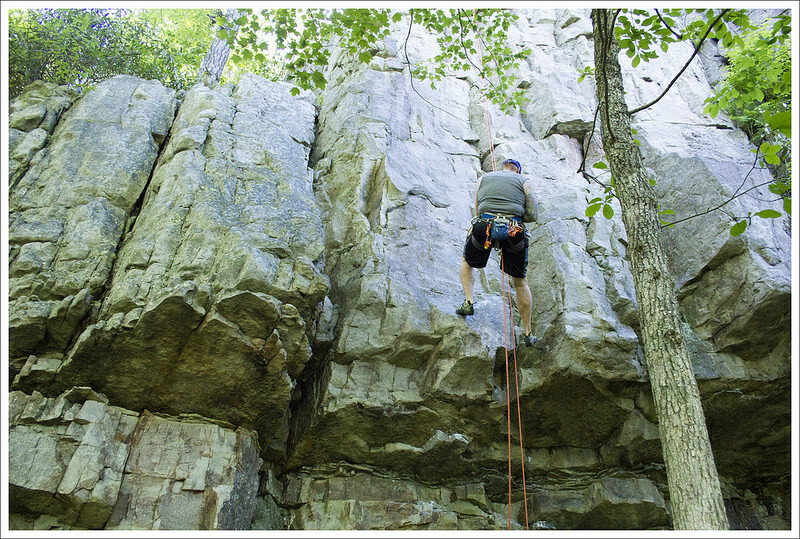 We were hoping to get some shots of the rock climber, but he had just switched spots on where he wanted to climb, so it took him a long time to position ropes to start his rappel. Tony let me even steer the drone a bit which was a blast. 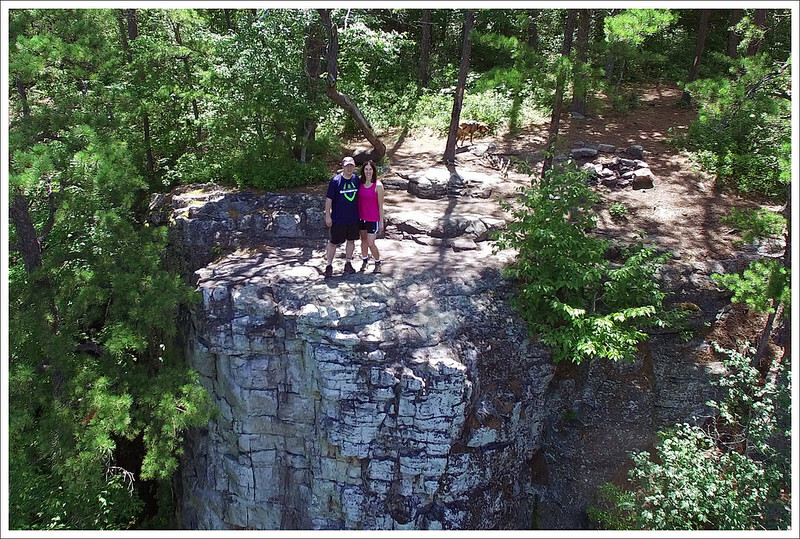 Christine and I posed for a high elevation selfie before we packed up the drone and continued our hike. We went back to where the trail split leading us to the rock outcropping and then continued on the trail. This part of the trail was less-traveled and narrow. After skirting along another large rock face, I found a break between two large rock areas and decided to explore. I had to climb by holding onto rocks and roots, making it not an easily accessible sidetrip that should only be done if you feel capable. I ventured out to the right and left areas of the rock. The rock to the right led to precarious footing and fearing I was going to look for a handhold and upset a timber rattler, I decided to not go any further on that rock. On the left rock, I found a way to climb to the very top and found a very small perch to enjoy some views that I thought were better than those on Hidden Rocks. I called back down to the rest of the group and Tony and Christine decided to climb up also. We then made our way down the steep decline and joined Linda back on the trail. The trail descends rather steeply after this point, causing us to take our time make sure we had good footing. We reached another stream crossing at 1.4 miles and at 1.6 miles we were back at the small waterfall, completing the small lollipop loop of this hike. We retraced our steps and made it back to our car at 2.5 miles. We were thrilled to see Tony and Linda again for the second time in the span of just a few weeks! We were also pleased to have cooler, less humid weather for this hike (compared to the sauna-like conditions we had for our hike at Shrine Mont). The morning started off with a bit of chaos related to bad directions. 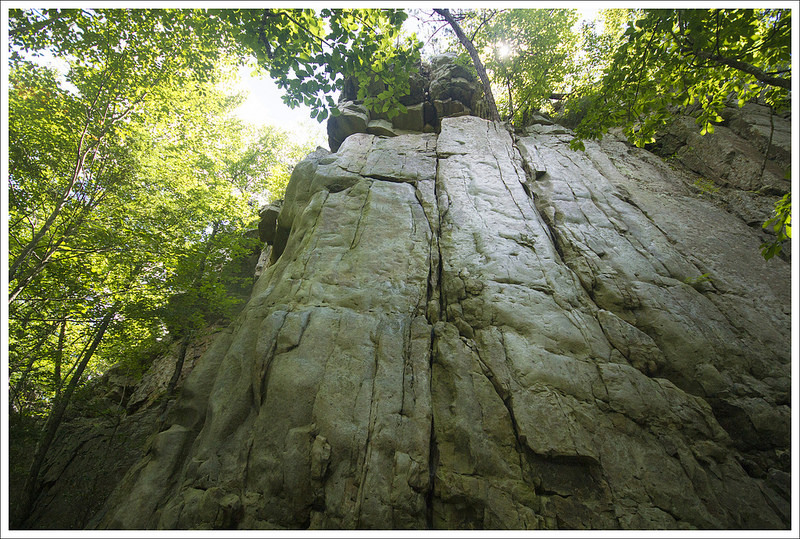 We originally found the Hidden Rocks hike outlined on the Virginia Wilderness Committee website. Their write-up included GPS coordinates that took us to some random road – in the middle of nowhere – about 30 minutes from the actual trailhead. We arrived at their designated coordinates and found ourselves in the totally wrong place with no cell phone service. Fortunately, Tony and Linda were also running a few minutes late, and we all arrived at the trailhead parking around the same time. The hike started off over a mini ‘roller coaster’ – with the trail steeply ascending and descending over a series of gullies and washes. 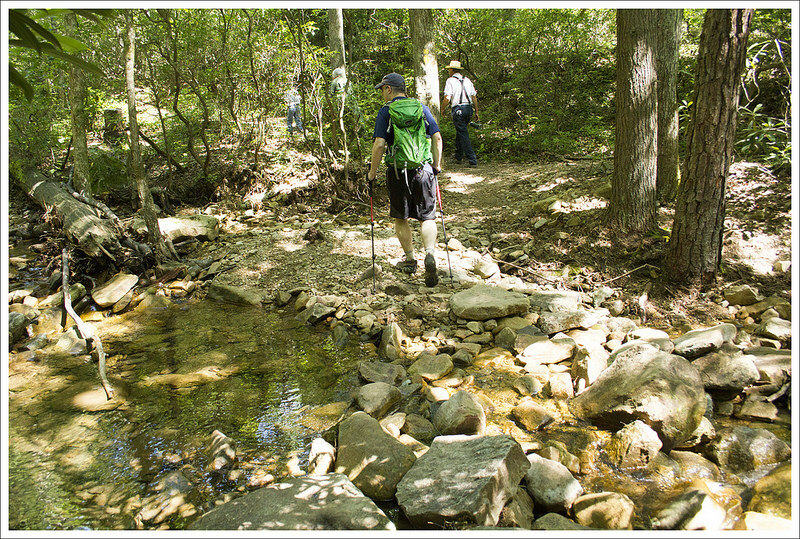 Eventually, we descended a gentle hill down to Rocky Run – a shallow, winding stream. 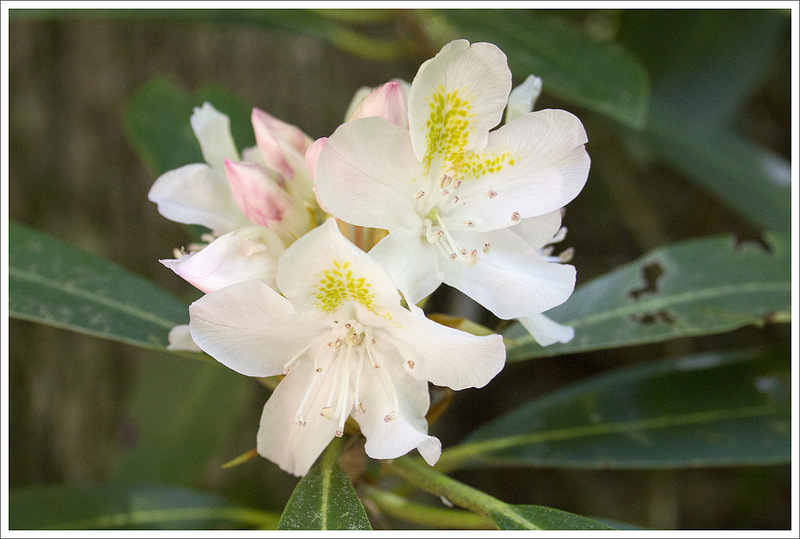 The trail was shaded by a tunnel of Rosebay Rhododendron that was just starting to bloom. At about a mile in, the route got a bit confusing when we reached a split in the trail near a small waterfall. The Virginia Wilderness directions said there was a loop trail, but added that the loop route was not on their map (it’s on ours – see below). We took a guess and headed steeply uphill on the trail on the right side of the split. In just a couple tenths of a mile, we arrived at the bottom of a towering rock wall – Hidden Rocks. There was a local guy rock climbing. He had a beautiful Vizsla dog – she barked a lot, but was very friendly and hung out with us the entire time we visited the rock. The second crag on the hikes is known locally as Hidden Cracks. Below: The view from the top of Hidden Cracks; Christine scrambles down Hidden Cracks; We enjoyed beers and Grillizza Pizza after the hike. To reach the summit of Hidden Rocks, we followed the trail along the left side of the crag, eventually climbing steeply to the top via a small set of constructed stairs. The top of Hidden Rocks has two outcroppings and a spacious campsite with a fire ring. 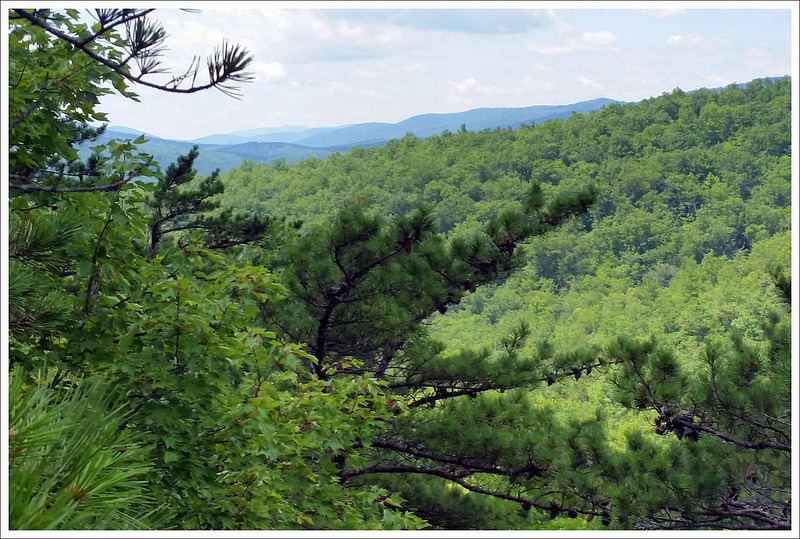 The views are limited – all you really see is another hillside of trees across the ravine. If you’re looking for expansive views of mountains, distant valleys, or the lake in Hone Quarry – this is not the hike for you! Fortunately, the outcropping still gave Tony enough room to launch his drone. He was able to get a few cool shots looking back at Hidden Rocks. From Hidden Rocks, we came back down the stairs and continued following the trail across the ridge. We passed another towering cliffside on the right – this one called Hidden Cracks. Adam found a split in the rocks with a jumble of boulders. We were able to climb to the top and get another view – this one included an obstructed peek at some distant mountains. Soon after Hidden Cracks, the trail descended, crossed the stream again. We arrived back to the split in the trail that made the loop, passing the small waterfall once again. From there, we retraced our steps back to the parking area. 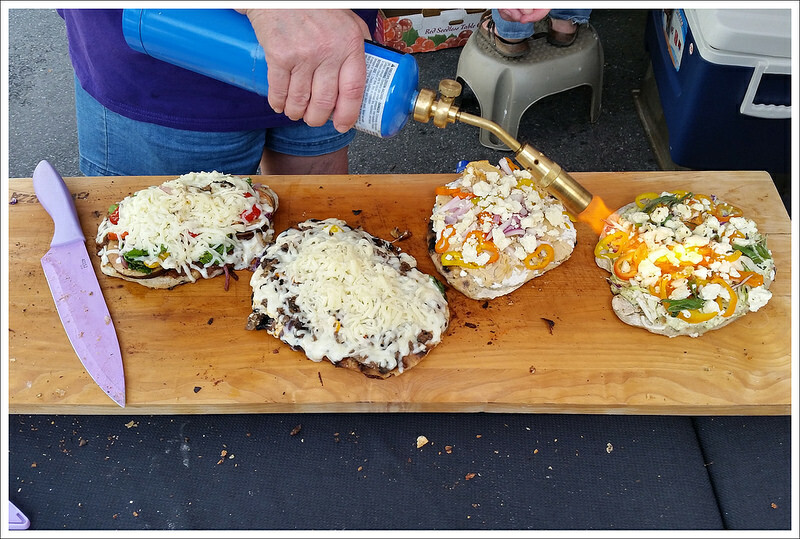 After our hike, we headed back into Harrisonburg so that we could take Tony and Linda on a tour of Harrisonburg’s craft beer scene. We started off at Wolfe Street, then proceeded to Billy Jack’s for lunch. The day rounded out with stops at Pale Fire and Brothers (with dinner from the Grillizza food truck). It was a fun day and we really enjoyed exploring this little gem of a hike! Difficulty – 2. This is doable by most people. 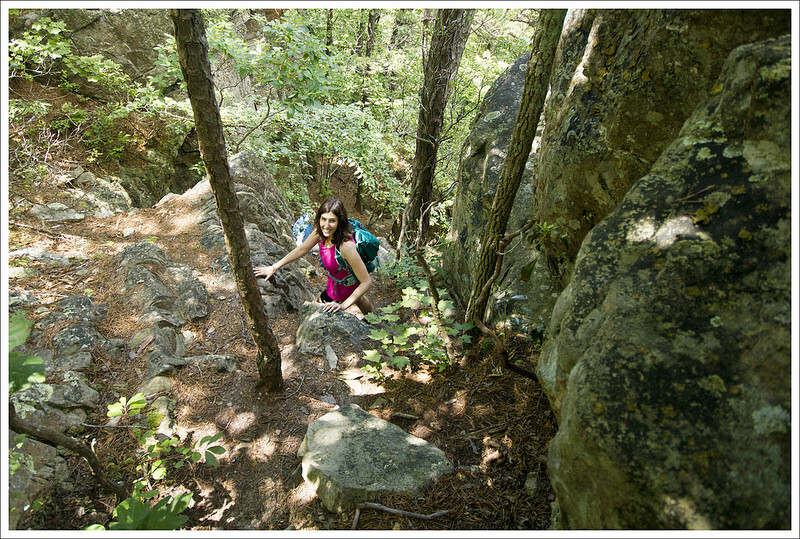 If you do the entire loop, be careful climbing up to the top of the other rock outcropping. That short climb feels more like a 4-4.5. Trail Conditions – 3.5. Overall the trail was in great condition, but the lollipop loop part of the trail was not as maintained. Views – 2.5. The views were nice, but not as expansive as I would have liked since most of your views are blocked by the mountain directly in front. Waterfalls/streams – 2. Rocky Run was pretty with rhododendron nearby. The small waterfall creates a peaceful setting. Wildlife – 0. We didn’t see anything. Ease to Navigate – 2.5. There weren’t any signs for junctions which caused us to get confused about which way to go when we first crossed Rocky Run and again at the waterfall junction. Solitude – 4. This isn’t heavily used, but you may see some people at the top of Hidden Rocks or rock climbing. Directions to trailhead: GPS Coordinates for this hike are 38.44813, -79.12205.